Autumn leaves falling, only minor work left on three British singles. So it is time to put another project on the workbench. In my youth I had a Dominator 99. In the winters I modified it to look more racy. Lightened it some 30kg and tuned it. In those days fancy parts could be obtained easily at a local shop. The good handling of the featherbed frame kept me alive, which not always was the case with fellow Triumph riders. After a couple of years it got Dunstall silencers, replacing the straight pipes. Reason was that I was chased twice in one day by a police car. Never stopped to hear what they wanted. Sadly I traded it for a Jawa speedway bike. A couple of years ago, I found a 650SS. Started to take it apart as a full renovation is needed. Then other things stopped the project. It's time now for giving it some attention. Plan is to build it as the 99 should have looked in my dreams long time ago. Last edited by Mike 40M; 10-17-2018 at 07:15 AM. CaTacL1sm and Cyorg like this. Done so far. It came with 18" Borrani rims so no problem there. Wheels checked and new Avon race tyres fitted. Brakes checked, no problems with them. The bike came with a 4LS 230mm front brake, suspect it's a Ceriani. Changed bushings, seals and stanchions in the Roadholder fork. Fitted dust seals of Commando type. Saves some weight. It came with an alloy top yoke, I think quite goodlooking. Still some work to do on the chassis, will tell about it later. Finally got alloy mudguards, they has been unobtainable for some years. My plan now is to cömplete the chassis first. Then restore gearbox and last engine. Reason for that is that if the engine turns out to be too bad, I'll find something else to put in it, maybe it will end up as a Triton. 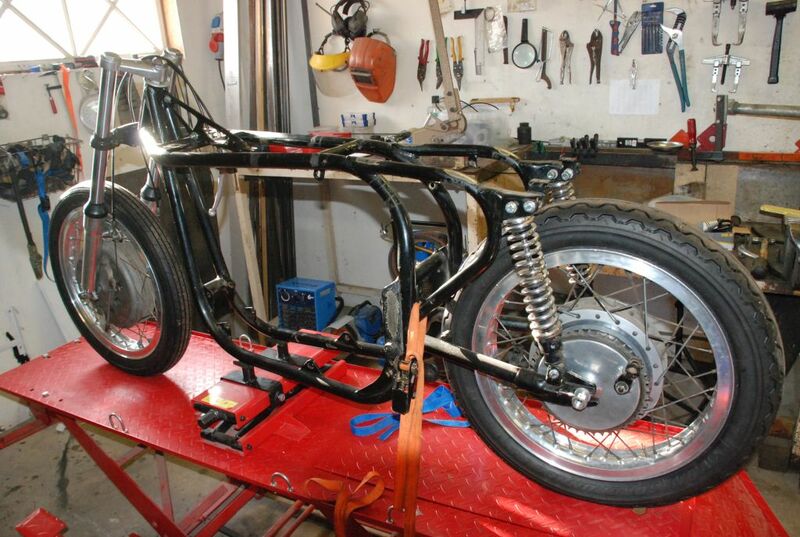 Plan is to build it the Brough-Superior way. First fit everything together, then a test run and last take everything apart, paint it and then assemble it. Long time since last update. 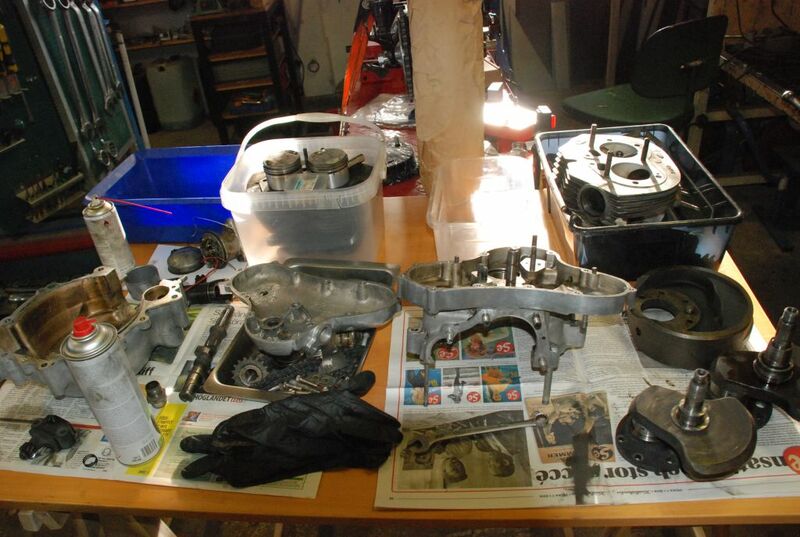 Sorting out the Honda CB250 racer problems, the RG250 racer problems and a lot of other things. The fitting of a Ceriano? wheel into the Roadholder fork was less than perfect. A bushing was needed to get the wheel axle fit nice in the slider. Never made a thinwalled bushing before. Wall thickness 1.15mm (.045"). So I started with making an expanding mandrel. Then drill and ream inner diameter to a nice slide fit on the axle. Finally turn outer diameter to fit the fork slider. Next small task was to make a spacer so that the front wheel was centered in the forks. Change of plan. Since most Norton parts needed for the bike are obtainable only in the UK, I'll have to get most parts before Brexit. An increase in price somewhere between 5 and 10% is no fun. 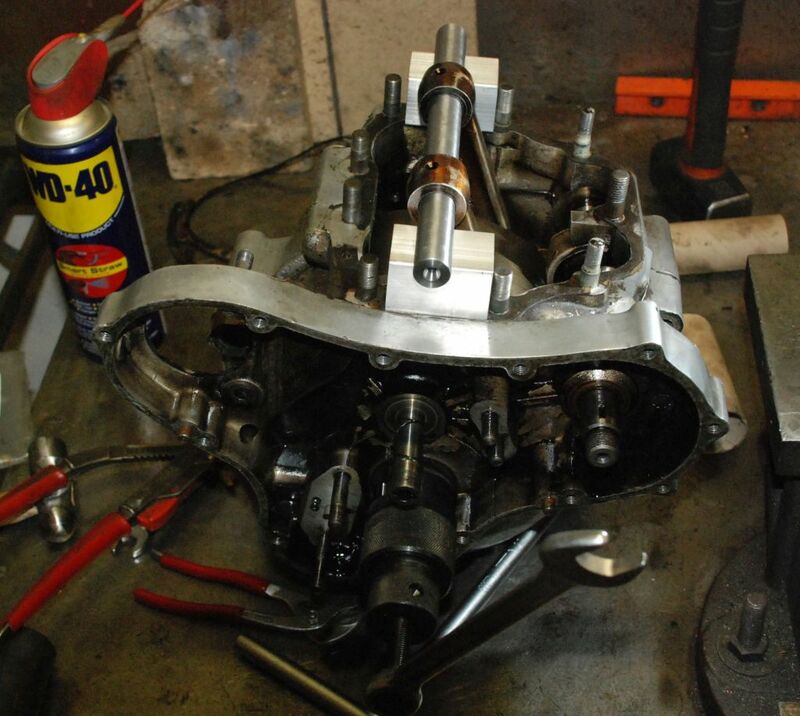 Now engine and gearbox will be stripped, so I can get needed parts before end of March. 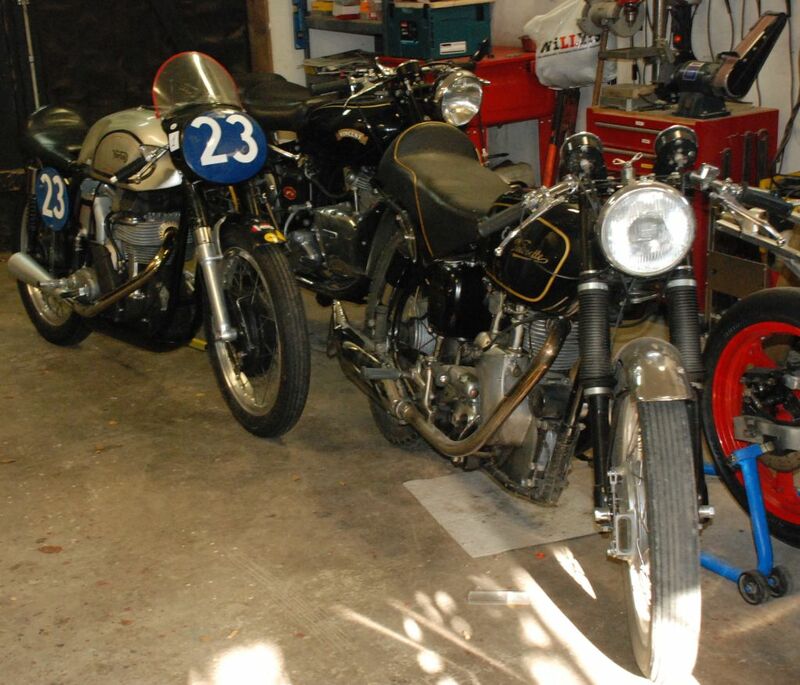 I have not stripped a Norton Twin for decades. So it took some time figuring out how. Found some special tools was needed, now got them from the UK. I don't think I'll do it as we did it in my youth, fixing an Enlish bike is only dependant of hammer size. So far, looking not too bad. One leaking exhaust valve. Inlet pushrods need replacing. Cylinder and pistons seems good, will measure them. Main problem might be if crankshaft needs grinding. Cleaning and cleaning. Then checking. Not checked head yet. Crank needs regrinding. Too oval on right side, 4 thousands. Probably caused by dirt in oil. Cavity in the middle of crank acts as a sludge trap, so left side got clean oil. Hopefully -.010 will do. Will have to check conrod big ends for ovality. Cylinders are +.040, wear about a thou, will do. Cam ok, marks on followers. Oil pump has end play, will see if possible to fix, otherwise not cheap to replace. Otherwise everything looks quite good. Happy that all mating surfaces are ok, I've seen too many engines with screwdriver marks. I decided to check if the gearbox was OK. The AMC gearbox is an easy one to take apart. Only two special tools needed. Done in two hours. But checking parts list, searching suppliers and order needed parts took a full day. Four gears, one ball bearing, half a dozen bushings, some seals and gaskets to replace. I'm quite certain that the bike has once upon a time been worked on by a skilled mechanic. Some punch marks in the right places. Sadly after that some amateurish jobs done. Another month gone. Crank grinder has too much to do. He estimates two months. Now two racers ready, the CB250 and the RG250. Redesigned the electrical system. All but the alternator will be exchanged. Only waiting for a new ignition system stuck in customs. Next will be assembly of the gearbox. does that great big weight thing bolt between the crank halves? 1963 Norton 650SS race bike. Am I up shits creek?